St Therese of Lisieux, when pondering the symbolism of the garden for which she has become so famous, wrote that she realised that we couldn’t all be roses and lilies. She personally identified more with a smaller, less significant flower, and she discovered beauty in being that flower rather than some of the others she had once longed to be. The Little Way of St Therese is indeed a message of comfort to we former sisters, if only one can get past the contempt that comes with an over-familiarity with the general notion of The Little Way, and actually embrace it and live it. In my former community I celebrated my feast day on the 1st of October and St Therese of Lisieux was my personal patroness. Anyone who knows me well knows that I tend to gravitate towards grand plans and big ideas… I really need a saint like Therese praying for me, teaching me to be who I am and flourish as such in the Father’s Garden! Once, I dreamed I’d be a religious sister and I hoped I’d be a holy one. I longed to be a saint. I longed for union with God. I felt convinced that He had called me to be a garden enclosed – His sister, His bride. Some years on, I find that I am NOT a religious sister, nor am I holy – neither lily, nor rose, much less that garden enclosed. I still long to be a saint, and I still long for union with God… and thanks be to Him that through the life and witness of St Therese He has shown me that there is still a way… albeit a little way. As I learn to live The Little Way out here in my “post-convent” reality, the 1st of October is still special to me. I celebrate it almost as if it were my birthday… because any excuse for a party will do… but more seriously, because the day still has a significance that I can’t quite articulate. Unless you’re a close friend or family member, you may not notice anything different about the way I go about my day. OK… so I generally eat “solemnity food” (i.e. I indulge in sugar just a little bit), and if there are lunchtime meetings that interfere with my Mass plans, guess which one wins? 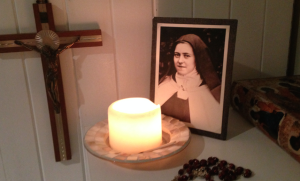 I have a picture of St Therese in a cardboard frame that I received from one of my former sisters on the day I received the habit… I’ve kept that picture and it receives pride of place in my “prayer corner” on October 1st. I still think of it as “my feast day” and I still consider it a day to “ask big” with a trust in the Father so characteristic of St Therese… through her intercession. I pray in a special way for all my former sisters who shared that feast day. All of these external things are so little… so little… but they help to make the day special internally. My friendship with St Therese has been such an important feature of my post-convent healing. She has been such a faithful friend and has helped to keep the lines of communication open with our Heavenly Father when my heart was hurting most and I was tempted to turn away. I don’t know how successful this would be, but I’d love to open up some discussion here in the comments below, among you, the Leonie’s Longing readers. We’re a community, after all, and we share a life experience that unites us in Him. Each one of us once longed to be a part of that garden enclosed… perhaps lily, perhaps rose. Some of you will have been in religious life long enough to have had a religious name and/or feast day. Those of you who returned home before receiving a name, or who belonged to communities that retained Baptismal names, may still have had a particular saint you considered your patron. And so I ask you.. do YOU still celebrate your “feast day”? If so, how do YOU make it a special day? This October 1st, my feast day, I will again “ask big” – this time for each of you, my sisters in Him.